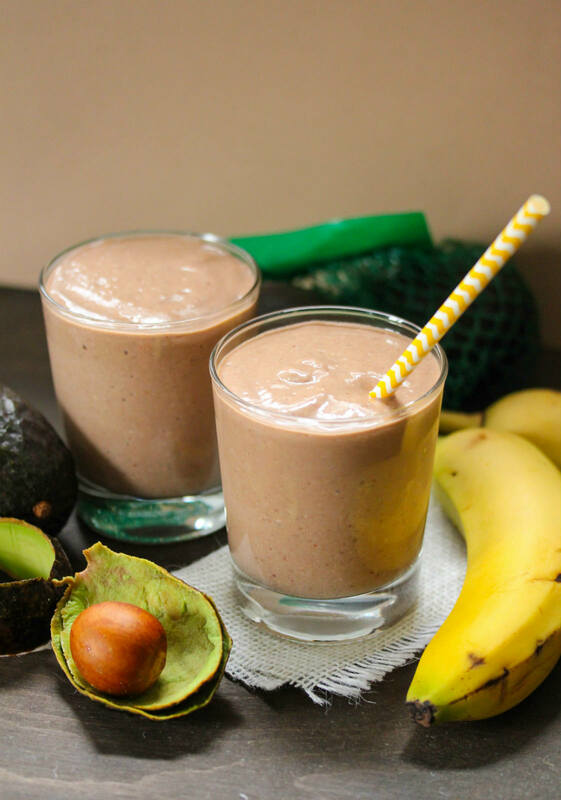 Fantastic recipe for homemade avocado smoothie made with banana and cocoa. The combination of this delicious fruits is incredible because it is just so deliciously smooth, rich and creamy. And still it is so wonderfully light and it is so fast for preparation – literally three minutes from cupboard to cup. Avocado contains healthy fats that will boost your mood as essential fatty acids increase serotonin production and improve your sense of wellbeing. Make sure you introduce avocado to your menu by adding it to salads, smoothies, sandwiches or enjoy half of one as a snack. Your will feel much better in both mind and body. Dates are nuggets of nutrition that satisfy a sweet tooth, making them ideal snacks to stave off hunger. Dates provide more calories than most fruits, but they make a great substitute for processed sweets, like candy, to help you stick to your weight-loss routine. Banana improves your mood thanks to the presence of vitamin B. Vitamin B6 in particular supports the production and function of serotonin, melatonin and dopamine in the brain. High total intakes of vitamins B6 and B12 are associated with a lower risk of depressive symptoms, according to the results of a study reported in the American Journal of Clinical Nutrition. Regular consumption of banana is known to reduce stress effectively, fight depression and offer anxiety relief. Almond Milk is and excellent source of proteins necessary for strong bones and prevention of arthritis and osteoporosis. Its abundance of vitamin E offers amazing nourishment as well as protection from free radical damage. Pit the dates, peel the banana and avocado, cut them in pieces and place all the fruits into the blender. Add all the other ingredients in the blender and blend for 2 minutes until the mixture is smooth. Serve the smoothie in a high glass over a few ice cubes.